Prepare the area for some serious wood furniture cleaning. Vacuum the furniture and remove the dust. 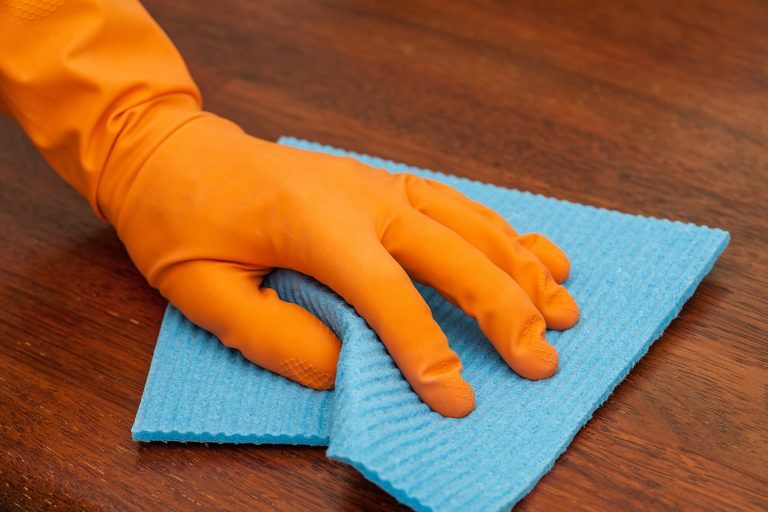 Cleaning wood furniture with vinegar and water. Perform a final buffing to remove moisture. Using vinegar and olive oil as a furniture polish. So, you have invested in a nice wood furniture set. Or maybe it was a piece passed down to you from your parents and you don’t want it to look like it was passed down. We can spray polish on it and give it a once-over, thinking that shiny wood means clean wood. But is it really? Over time, the buildup of dirt, oil, and dust can dull and darken the look of the wood. A good cleaning will not only beautify the wood, but help extend the life of your favorite furniture. 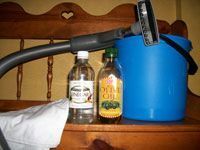 I am going to outline some steps in cleaning your wood furniture using a green approach that is safe for most wood surfaces: good old fashioned vinegar and water. While vinegar is a very mild cleaning agent, you should test it first on a small, inconspicuous area of the wood to be safe. For antiques or valuable pieces, you may want to consult a professional restorer about the type of finish and the proper method for cleaning the piece. For most of you, the following method will be effective in removing dirt and grime from your wood furniture. Gather your cleaning supplies. Cleaning wood furniture is pretty uncomplicated. Get out your vacuum cleaner and a bucket that will hold at least a gallon of water. 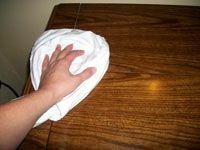 Find some soft cloth rags that are clean, making sure they have not been used with other cleaning products that may damage the wood. I personally like microfiber cloths. Retrieve your white vinegar from the cupboard. You may also need to grab your vegetable or olive oil if your wood is due for polishing. Prepare the area for some serious wood furniture cleaning. Most furniture tends to have hardware attached or is used as a countertop for household objects. To make this job easier, you will want to free up access to the wood. Unscrew and remove hardware (as long as it is not keeping the furniture together—like handles). If you think there is a small chance you won’t be able to get the hardware back on, skip it. Then remove everything from the piece to be cleaned such as pillows, cushions, lamps, and other objects. If you need to, pull the furniture away from the wall to get around the entire piece. 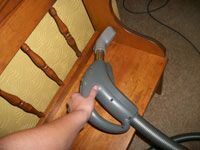 Vacuum the furniture and remove the dust. Use your vacuum and its brush attachment to gently remove dust from the surface and cracks. Don’t use the attachment for upholstery (the one that spins). The resulting scratches will be your fault, not mine. While you have the vacuum out, you may also want to give any cushions you removed a good cleaning. 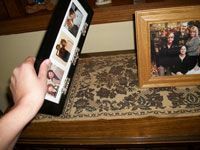 There is no point in putting filthy cushions back on a clean wood frame. If you really do not want to lug out your vacuum, you could lightly moisten a cloth and softly wipe down the wood to grab and remove the dust. Cleaning wood furniture with vinegar and water. 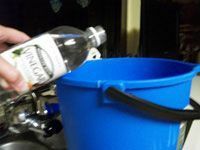 In your bucket, mix half a cup of white vinegar to half a gallon of warm water. For larger surfaces, you may want to double it. You can either spray the vinegar mixture on a soft rag or dip the rag into the bucket and then wring it out thoroughly. Be careful. Excessive water on wood can cause damage if it penetrates the finish. With your moistened cloth, wipe in a circular motion. Rinse the cloth when it becomes visibly dirty or switch to a clean rag and continue until the entire piece has been cleaned. Perform a final buffing to remove moisture. Take a fresh, clean cloth and go over the wood one more time. Buff in a circular motion to achieve a bright, shiny finish. Be sure to remove as much water as you can from the furniture. You may notice areas that are not as clean as you had hoped. Do not despair. Just go back to the washing step and give it another shot. Make sure you finish with this step as you do not want to leave moisture sitting on the wood finish. Using vinegar and olive oil as a furniture polish. One or two times a year, you are going to want to revive your wood with a good polishing. Vegetable or olive oil will do the trick. I prefer olive oil because it is less fattening . . . yes, that’s a joke. 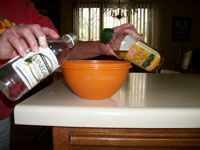 Mix a quarter cup of olive oil to a quarter cup of white vinegar. Use a soft cloth, apply a small amount of the mixture to the wood and buff the wood to a shine. The oil should replenish moisture to the wood. Again, you should test a small area first. A part of proper wood maintenance is determining the wood’s finish: Is it oiled, painted, or a polished hardwood? Or is it a special wood (like bamboo) that may need occasional re-moisturizing? Consult instructions for proper care or look at the manufacturer’s website for tips. The purpose of waxing is to restore the durability of the finish, but be sure to use a wax specially made for wood. The other option is to use an oil-based polish, but oil is not as effective in creating a hard finish. Whatever you do, do not wax an oiled wood as it will cloud the finish. Likewise, do not use an oil polish on a waxed surface. Painted wood is best cleaned with regular dusting or using a moistened rag to wipe it down. There are general maintenance steps you can employ to extend the life of your furniture. Try to keep your wood furniture out of direct sunlight or at least try to minimize exposure. Storing the piece in excessively moist areas can also cause cracks. Additionally, dusting on a regular basis will help prevent the dulling effect of dirt buildup. And even though I personally dislike them, using doilies to guard the surface against wear is always a smart thing to do. Even if it looks stupid. Oak-Y Dokey Green Wood Cleaner is made with a special blend of natural conditioning oils that will clean, polish, and protect your wood furniture and bring out the natural shine of the wood. This cleaner is safe for most finished wood surfaces including wood furniture and cabinets. Plus, it will effectively remove dust, dirt, and the buildup on your wood surfaces without toxic fumes, silicones, or solvents. 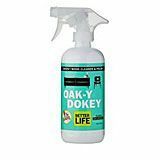 You can find Oak-y Dokey on Amazon. 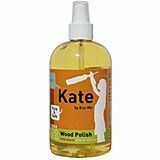 Kate by Eco-Me Wood Polish and Cleaner. This natural wood cleaning product is formulated with olive oil, fractionated coconut oil, and pure plant essential oils. All natural, Kate by Eco-Me is safe for your family and eco-friendly. The wood polish can be used on sealed wood surfaces such as wood furniture and cabinets and will protect the wood’s finish without the use of harmful chemicals. 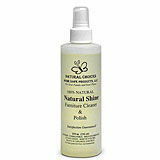 Natural Shine Furniture Cleaner & Polish is another all-natural wood cleaning product that will clean and polish wood furniture, fiberglass, Formica, paneling, vinyl, and cabinets. This product is created from natural orange oil and soy oil, so it leaves a fresh orange smell. Beyond removing dirt and smudges, the polish will hide minor wood scratches, removes soap and wax buildup, and helps repel future fingerprints.